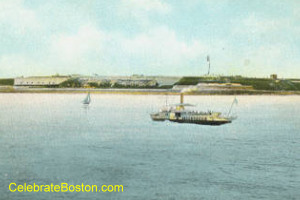 At the entrance to Boston Harbor is George's Island. Fort Warren was built there in the 1840s, and completed in 1850. The granite fort is pentagonal in shape, and was constructed with facilities such as barracks, ammunition magazine, store houses, hospital, kitchen, mess rooms, jail cells, and a battery of heavy guns that face the sea. During the Civil War, Fort Warren was used as prison for Confederate soldiers and dis-loyal citizens. Alexander Hamilton Stephens, Vice President of the Confederate States of America, was the most famous person imprisoned at the fort. The island was an inhospitable place, and Confederate soldiers found the cold weather unbearable in comparison to their southern homesteads. During winter, Union soldiers had purportedly seen mysterious shadows when patrolling the lonely beaches of the island, and such occurrences are likely what led to the modern ghost story. Mrs. Lanier received a letter from her husband that he had been imprisoned at Fort Warren. She was compelled to free him, making an epic journey from Georgia to Hull, Massachusetts and the home of a Confederate sympathizer. Hull is only about a mile away from George's Island. Mrs. Lanier systematically observed the fort with a spy-glass, and on a stormy night in January 1862, had rowed across to George's Island and went ashore. She cut her hair short and dressed as a man, and brought with her an old pistol and small pick-axe. She made her way to the dungeon cells, and from outside the fort signaled to her husband by whistling an obscure southern tune, to which he signaled back. Mrs. Lanier was able to squeeze through the slit-window of his cell, and was then hidden by the Confederate soldiers. With the use of the pick-axe, the soldiers contrived to tunnel to the center of the fort, and then overtake the guards and obtain weapons. The tunnel took several weeks to dig, and on the eve of finishing the tunnel, a sharp blow of the pick had alerted a guard. The alarm was sounded, and the tunnel quickly discovered. As each of the Confederate soldiers was removed from the tunnel, a tally was taken. When all the prisoners were accounted for, Mrs. Lanier was to spring from the tunnel and capture a Union officer with the old pistol. Mrs. Lanier succeeded in surprising the officer, but he slapped the pistol from her hand. The pistol went off and the bullet struck and killed her husband. As punishment for her deeds, Mrs. Lanier was condemned to death by hanging. Her final request was to be given female clothing, and a search of the fort produced nothing but some old black robes. She was executed in these robes and buried on George's Island. According to King's Handbook of Boston Harbor by M.F. Sweetser (1883), the only notable prison escapes occurred after 1862. In 1863, a daring escape was made by six Confederate soldiers. They squeezed through slit-holes in the granite walls and made their way to the beach. Two of the soldiers attempted to swim to Lovell's Island, but the tide was going out and they were swept out to sea. A second notable escape was of two soldiers that constructed a crude raft and did make it to Lovell's. From there they obtained a small boat, and sailed out of the harbor. The pair were later re-captured by a coast guard cutter. Early stories of ghosts on George's Island do not exist, but Sweetser states the following about Civil War era folklore, "The sentry-posts were often made untenable by the dashing of the waves, and the guards had to be replaced by patrols. No wonder that the unfortunate sentinels saw mysterious shapes, so that an order was posted at the guard-house, 'denouncing severe punishment in any case where ghosts were allowed to pass a beat without challenge and arrest.' "